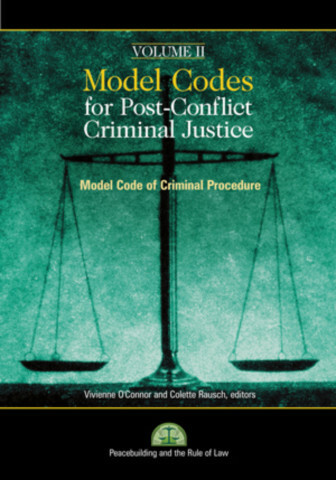 Volume II of Model Codes for Post-Conflict Criminal Justice continues the path-breaking work of volume I, providing an indispensable resource for those striving to reestablish the rule of law in societies recently wracked by violent conflict. Of unparalleled breadth, depth, and authority, the Model Codes for Post-Conflict Criminal Justice is a criminal law reform tool tailored to the needs of countries emerging from conflict. Its three volumes present four complete legal codes that national and international actors can use to create, overhaul, update, or plug gaps in the criminal laws in individual post-conflict states. Each volume offers not only substantive legal provisions but also expert commentary that explains wording choices, elaborates on the content of the provisions, and highlights associated considerations and reforms. Volume II lays out a comprehensive Model Code of Criminal Procedure that details the rules and procedures that govern the investigation and adjudication of a criminal case. Divided into sixteen chapters, the code covers everything from the rights of the accused and the treatment of victims to witness protection and juvenile justice, from the investigation of a criminal offense to arrest, indictment, trial, appeals, international cooperation, and extradition. The Model Codes for Post-Conflict Criminal Justice is the culmination of a six-year project spearheaded by the United States Institute of Peace and the Irish Centre for Human Rights, in collaboration with the UN Office of the High Commissioner for Human Rights and the UN Office on Drugs and Crime. Some three hundred experts and practitioners from across the world were involved in the drafting, vetting, and revision of the provisions and their commentaries. This enormous breadth of expertise has allowed the Model Codes to draw on lessons learned in a variety of post-conflict states and from the laws of a remarkable variety of the world’s legal systems and traditions. —Each copy of this volume contains a CD of the book. Vivienne O'Connor is an independent rule of law consultant with fifteen years of experience in the field. She heads TransformLaw, an interdisciplinary consulting firm that provides strategic advice on how to facilitate transformative legal change processes in conflict-affected and developing countries. From 2007 until 2016, Vivienne worked for USIP as a senior rule of law adviser and as director of the International Network to Promote the Rule of Law. She has engaged in rule of law projects in numerous countries that include Afghanistan, Burma, Haiti, Liberia, Nepal, and Syria. Vivienne has trained hundreds of rule of law practitioners through the “Rule of Law Practitioner’s Course” that she designed and delivered for USIP, the UK Department for International Development, and the Australian government. Vivienne holds a bachelor’s degree in civil law, a master’s degree in international human rights law (LLM), and a PhD in law from the National University of Ireland, Galway. She is the author of several books, including volumes 1 and 2 of Model Codes for Postconflict Criminal Justice. She is currently writing a monograph titled Transformative Rule of Law: Theory and Practice.